Made in 2012 and receiving its premiere at that year’s Venice Film Festival, Ramin Bahrani’s rural fathers-and-sons saga finally gets a release. Arriving three-months after the director’s more recent repossession drama 99 Homes opened in the UK, this is a slower-burn of a movie, less fuelled by anger, but it fits right in with his earlier socially-conscious work Man Push Cart and Chop Shop. 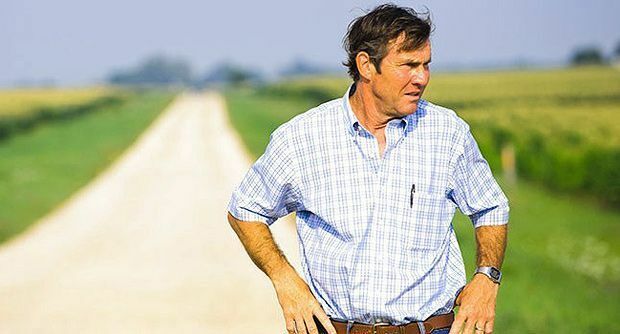 Here, Dennis Quaid plays Iowa corn magnate Henry Whipple, who lives by the mantra ‘expand or die’. A father of two, Whipple is desperate for his offspring to inherit his business – difficult, with one son absent and the other, Dean (Zac Efron), entirely uninterested in farming. Still at that awkward adolescent stage, Dean is dating the lovely Cadence (It Follows’ Maika Monroe) and dreaming of becoming a pro stock car racer. His father, meanwhile, sees his world unravel after he finds himself under investigation for patent fraud. Hugely inspired by Arthur Miller’s Death of a Salesman, with its depiction of the American Dream soured, At Any Price is carefully scripted, modestly shot and competently acted. Quaid is near-perfect as the craggy patriarch who boasts an underlying ruthlessness in his approach to capitalism. Efron, too, is impressive – albeit in a sub-James Dean sort of way – in a mature role far removed from the fluff that dominated his early output. As is typical with Bahrani, there’s a huge grounding in reality here, which yields an impressive depiction of modern-day farming and the struggles between individuals and corporations. Likewise, scenes set around the stock car track are muscular and shrewd. It won’t be for everyone – the pacing is glacial at times – but At Any Price certainly deserves attention. An old-fashioned drama, the likes of which are becoming rarer by the day in Hollywood, quite why it’s taken three-and-a-half years to secure a UK release is anyone’s guess. Selected release from Fri 1 Jan.
Iowa corn magnate Henry (Quaid) is desperate for his offspring to inherit his business, but son Dean (Efron) is more interested in being a stock car racer. Carefully scripted, modestly shot and competently acted old-fashioned drama, if glacially paced, with fine work from Quaid and Efron.